On Saturday 18 January 2014, the French EU Naval Force (EU NAVFOR) Somalia Operation Atalanta flagship FS Siroco, in cooperation with Japanese assets, released the crew of a Dhow that was suspected to have been used as pirate mother-ship. The flagship apprehended 5 suspected pirates believed to be responsible for an attack on an oil tanker in the Gulf of Aden a day earlier. The oil tanker i ssued a distress call to the UK Maritime Trade Operation (UKMTO) on the evening of Friday, 17 January, reporting to be under attack. According to the reports, the attack was repelled by a private armed security team embarked on board the oil tanker. The skiff then headed to a dhow which lingered nearby. 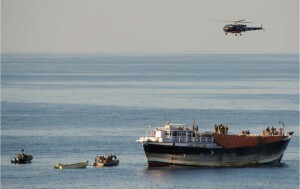 The EU Naval Force, in cooperation with other Counter Piracy Forces, reacted quickly to this incident. A Japanese Maritime Patrol Aircraft and a helicopter from the Japanese vessel JS Samidare, in associated support to the Combined Maritime Forces (CMF/CTF 151), initially located the dhow. The EU NAVFOR flagship FS Siroco was then able to close distance to the dhow and launch their helicopter and boarding team. Once the Siroco’s team boarded the dhow, 5 Somali suspect pirates surrendered and were separated from the dhow’s crew and transferred to FS Siroco for further investigation. As always, the EU Naval Force seeks, if possible, a legal finish with the prosecution of the suspected pirates. Tagged piracy 2014, piracy attack, pmsc.